Need to keep younger children entertained? 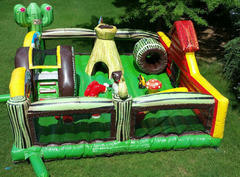 The toddler inflatable playland is a stress free to keep them busy. It has a slide, rocking horse, ball pit, small tunnel to crawl through. Safety netting keeps them safe inside.